Look no further for one of the smartest, most innovative hanging folders around. Features SureHook™ technology with revolutionary built-in tension springs. Rods bend less while folders stay on rails and slide with ease. Rods and hooks are stronger and sturdier. Folders work with existing systems. Patented polylaminate reinforced tops and bottoms provide strength. Lighter interior colors help prevent misfiles. Includes tabs and inserts. Hanging File Folder Type: Standard; Size: Letter; Expansion: 2"; Material(s): 11 Pt. Stock. Paper contains 10% post-consumer recycled content, 10% total recycled content. 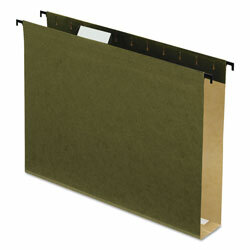 8 1/2 x 11 Green Hanging File Folders from Pendaflex! 396 In Stock today.